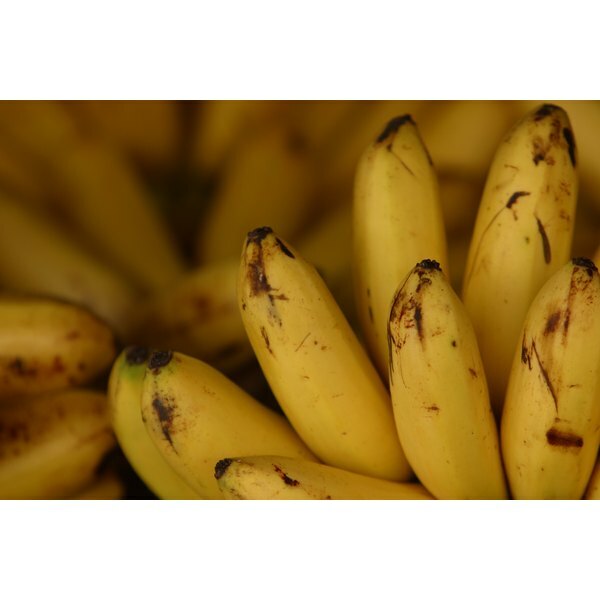 Choose ripe bananas for easy mashing. 2 Is There a Substitute for Eggs in Baking a Yellow Box Cake? Many Americans are unable to cook or bake with eggs, either due to an allergy to egg proteins, or because there is a vegan in the household. Eggs are not easy to replace, given the multiple roles they play in the kitchen. However, you can often use common household ingredients, including applesauce, bananas and bread, instead. Replace each egg in your recipe with 1/4 cup of cooked, cooled applesauce. Remember that apples have a distinct flavor of their own; choose a recipe that's compatible with the apple taste. Use 1/4 cup of mashed banana in place of each egg in your recipe. Again, choose a recipe that's compatible with the flavor of the fruit. Increase the baking powder in your recipe by 1/3 to 1/2. Using fruit in place of eggs makes denser baked goods, and increasing the baking powder will help compensate for that. Prepare a boxed cake mix with applesauce in place of the eggs, oil and water. It will be moist and rich, but have lower fat and fewer calories. Bind ground meats for meatballs or meatloaf by using one cup of fresh breadcrumbs or 1/2 cup of dried breadcrumbs for every 1 1/2 lbs. of meat. Soak the breadcrumbs in milk, to improve their binding effect. The proteins in milk help replace the egg proteins. Squeeze out any excess moisture before adding the crumbs to your ground meat. Mix the ground meat and breadcrumbs thoroughly to ensure a consistent texture in the finished dish. Cook the mixture as you normally would for meatballs, meatloaf or other dishes. You can also use tomato puree, pumpkin puree or pureed fruit in place of the applesauce or bananas. You can use finely milled oatmeal, flour or a basic white sauce in place of the breadcrumbs as binders for meat. "On Food and Cooking: The Science and Lore of the Kitchen"; Harold S. McGee; 2004"